This week Jason and Gabe look at the history of the first great Star Wars video games, 1983’s Atari Star Wars : The Arcade Game. Made in a time when the arcade market was dwindling and Atari desperately needed a hit, this Star Wars game was one of their only hopes. Take a trip back into the world of vector graphics as Blast Points explores how the awesome game got made and how it helped usher in a new era of Star Wars games all while home video games crumbled around it. PLUS : Star Wars Resistance! Forces of Destiny featuring The Gorax! YES, THE GORAX! We are just weeks from Solo : A Star Wars Story and SoloMania is running wild with clips, giant worms, 360 videos and more!! Can Blast Points survive SoloMania?! So join Golden Squadron, deposit 50 cents and celebrate the love with BLAST POINTS!! Join Jason and Gabe as they take a trip back to the simpler time of 2015 when Force Awakens rumors ran free across the land! Is Luke Skywalker an evil CYBORG?! Is Kylo Ren actually LUKE? Who are the Jedi Killers? Will Chewbacca die?!? And what about that new Jedi hero / ex stormtrooper and his trusty pal Kira? Is Max Von Sydow really playing Boba Fett?! Listen along as they go over what was true, what was just weird & what could still possibly happen! PLUS: Solo TV spots, Rio Durant asks about a “Wooookiee”, Kasdan & son talking Enfys Nest & more! Celebrate the love & listen today ! Buckle up baby because this week Jason and Gabe are going totally nuts about that Solo trailer!! They’re talking all about how the movie looks and going over the whole thing scene by scene and line by line. Space mice, space yaks, Therm Scissorpunch, Vegetable Man, Walnut Head, Chewie shredding guitar, tender Wookiee love and so so much more. PLUS : Howard the Duck and Radioland Murders even come up! Imagine that. So grab that flying V guitar, magnetize your boots, get pumped for SOLO and celebrate the love with BLAST POINTS!! 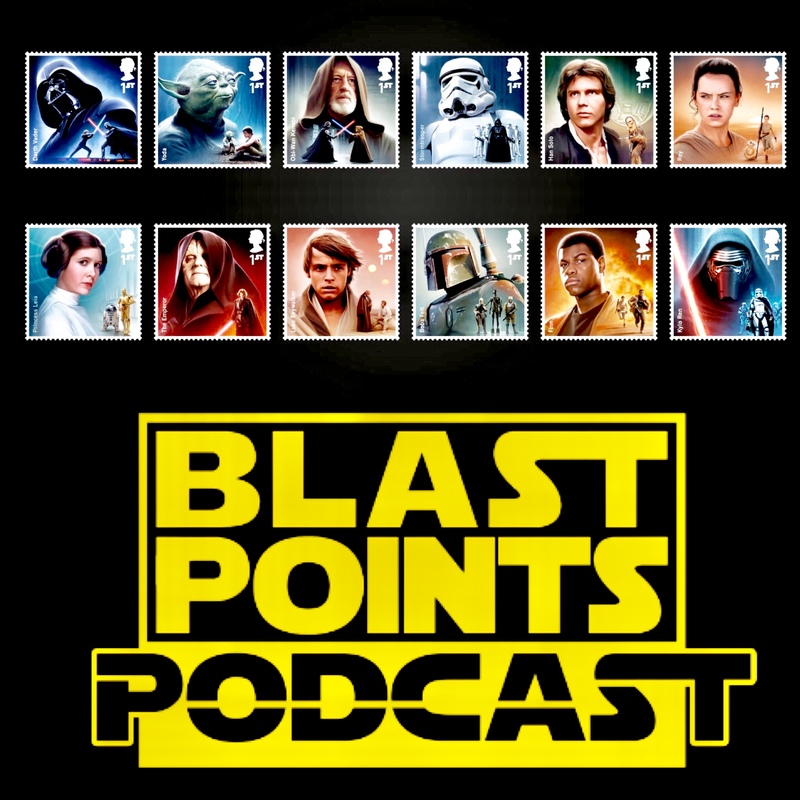 Join Jason & Gabe as they go through the first ever Blast Points Academy Star Wars Awards (Star Awards)! You listeners of the show voted and we’ve got the results! Who did YOU choose for the best Gungan? What movie has the best score? Who is the best new TLJ character, what’s the top animated series, lightsaber form and what won the the important best picture? Listen and find out! You may laugh a little, you may learn a little, and you’ll definitely love this action packed episode! PLUS : the start of Solo madness at Denny’s, Rain Johnson’s love of The Young Ones and how a Cliff Richard reference snuck into Last Jedi, a deleted scene we haven’t seen yet and so much more! So get out those Better Then Erpham records and celebrate the love with BLAST POINTS! It’s so hard to say goodbye to Star Wars Rebels but Blast Points is here to help get you through it all. Join Jason & Gabe as they look at the show’s past, it’s strengths, the challenges it faced and where they dream Lucasfilm Animation could go next. From those mysterious voices in-between worlds, the legacy of Ashoka Tano, giant wolves, to our hero AP-5 singing in space, Blast Points toasts four wild seasons of the Ghost Crew adventures. PLUS : Star Wars TV stuff, the Last Jedi deleted scene with Phasma whoop hogging it up, going Solo at Denny’s, listener reviews and The Lucas’ lively, action packed speech at Mark Hamill’s Hollywood Walk of Fame ceremony! So put on those Duran Duran records, head into the unknown regions with Space Whales and celebrate the love with BLAST POINTS! Listen as Jason & Gabe take a look back at 1999’s The Art of Star Wars, Episode I The Phantom Menace! It was the dawn of a new era of Star Wars concept art and it’s just as fascinating today as it was then! Doug Chiang endlessly drawing Battle Droids in the attic of Skywalker Ranch resulted in a legacy in Star Wars design that can still be felt today. They talk about their favorite illustrations from the book, Jabba on thrones, the idea of an older Anakin, Jar-Jar’s pet dog and MORE! PLUS: there’s some Solo speculation and a whole lot of Old Man Snoke love! So sip some morning coffee with Sebulba, smoke a cigar with a booger and celebrate the love with BLAST POINTS! Just in time for Valentine’s Day, join Jason and Gabe as they celebrate Love, Lucas Style! 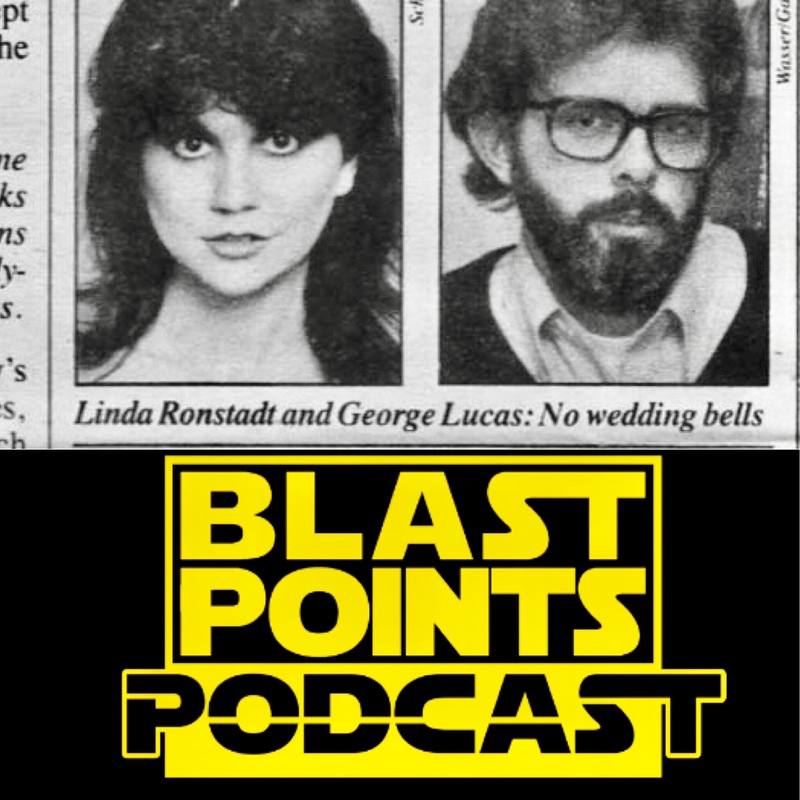 They go over almost everything Lucas Love with : his wild relationship with Linda Ronstadt, Lucas tap dancing, playing guitar and what he may like to do on dates! Plus they take a look at the fan film classic, George Lucas in Love! Who likes and who kinda doesn’t? Listen and find out!! PLUS : all the latest news with Solo stuff from Entertainment Weekly and the latest on Game of Thrones creators writing and producing some Star Wars! So shave that beard, head to Taco Bell and celebrate the LOVE with BLAST POINTS! NEW EPISODE!! We’ve gone from zero to Solo in one week and Jason & Gabe are breaking down both the Super Bowl mini teaser and the full Monday morning preview! L3-37! Rob Halford! Singing Frog People! All that and so much more in this action packed Solo teaser FREAKOUT! Listen today, subscribe on iTunes, celebrate the love & PUNCH IT!! This week Jason and Gabe go all the way with the insane 1996 Star Wars VCR board game, Star Wars: The Interactive Video Board Game : Assault on the Death Star! A VHS only Star Wars art film where a creepy Vader talks to himself, wanders hallways and says the word “pupil” a lot. Like all Star Wars weirdness, this game has a wild backstory and features the final, expressive performance of David “The Real Darth Vader” Prowse as The Dark Lord of the Sith. 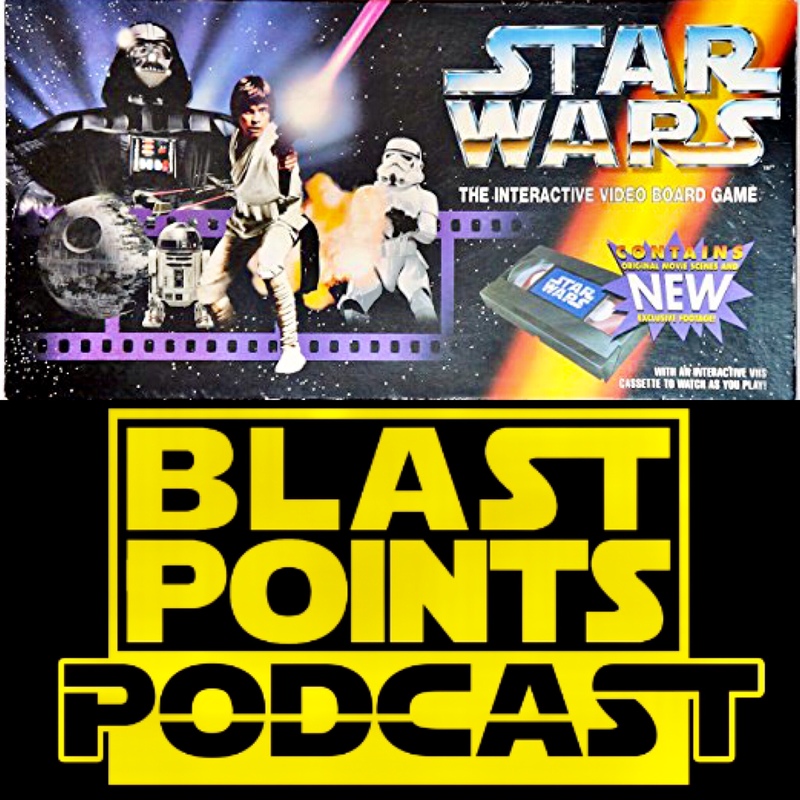 It’s a bizarre Star Wars experience and Blast Points is here to help you through it! Plus there’s Solo stuff, singing Hutts, George Lucas late night phone calls, Rebels trailer talk and much more! So grab your pupil, look for a snake in the stars and celebrate the love with BLAST POINTS!